The Blind Spot Monitoring (BSM) or Rear Cross Traffic Alert (RCTA) system notifies the driver of the presence of vehicles in adjacent lanes or at the rear of the vehicle using the Blind Spot Monitoring (BSM) warning indicator light, the warning sound and the display indicator (vehicles with multi-information display and active driving display) while the systems are operational. The Blind Spot Monitoring (BSM) warning indicator lights are equipped on the left and right door mirrors. The warning indicator lights turn on when a vehicle approaching from the rear in an adjacent lane is detected. When the ignition is switched ON, the warning indicator light turns on momentarily and then turns off after a few seconds. The Blind Spot Monitoring (BSM) detects vehicles approaching from the rear and turns on the Blind Spot Monitoring (BSM) warning indicator lights equipped on the door mirrors according to the conditions. 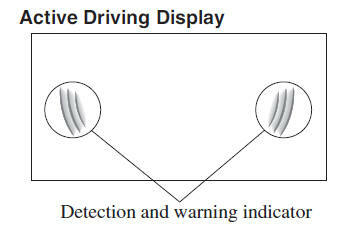 Additionally, while a Blind Spot Monitoring (BSM) warning indicator light is illuminated, if the turn signal lever is operated to signal a turn in the direction in which the Blind Spot Monitoring (BSM) warning indicator light is illuminated, the Blind Spot Monitoring (BSM) warning indicator light flashes. The Rear Cross Traffic Alert (RCTA) system detects vehicles approaching from the left and right of your vehicle and flashes the Blind Spot Monitoring (BSM) warning indicator lights. If the Blind Spot Monitoring (BSM) warning indicator lights turn on when the parking lights are turned on, the brightness of the Blind Spot Monitoring (BSM) warning indicator lights is dimmed. If the Blind Spot Monitoring (BSM) warning indicator lights are difficult to see due to glare from surrounding brightness when traveling on snow-covered roads or under foggy conditions, press the dimmer cancellation button to cancel the dimmer and increase the brightness of Blind Spot Monitoring (BSM) warning indicator lights when they turn on. 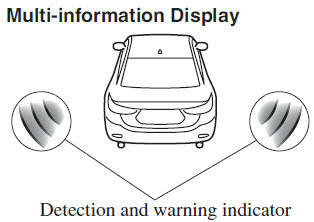 The detected approaching vehicle and warning are displayed in the multi-information display and active driving display when the vehicle is moving forward (Blind Spot Monitoring (BSM) operational). The detected direction is displayed with a detection indicator (white) when an approaching vehicle is detected. In addition, if the turn signal lever is operated to signal a lane change while the vehicle is detected, the display changes the color (amber) of the warning indicator. The Blind Spot Monitoring (BSM) warning beep is activated simultaneously with the flashing of a Blind Spot Monitoring (BSM) warning indicator light.